Many of the greatest sports movies have championed the underdog -- an individual or a team that defied the greatest of odds to succeed. Few individuals have defied greater obstacles to succeed in the sports world than Jersey City's Ed Lucas (pictured). His story is certainly the stuff movies are made of. And his story is apparently going to be a major Hollywood movie. 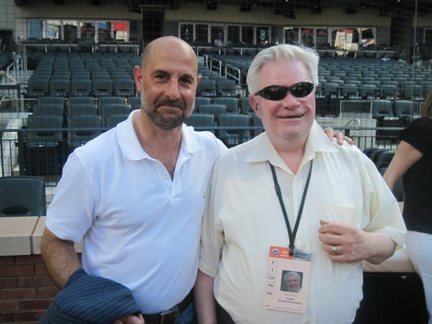 Acclaimed actor Stanley Tucci (pictured) has announced he will be directing -- and probably starring in -- a film about the life of baseball writer Lucas, who was blinded as a child and became one of the most respected and loved figures on the metropolitan New York sports scene. Lucas was 9 years old in October 1951 when Bobby Thomson hit his famed "Shot Heard 'Round the World" home run that won the pennant for the New York Giants. A huge Giants fan, he went out to play ball with some friends after that game and while pitching got hit between the eyes with a line drive, blinding him. He was determined to have a career in baseball, despite everyone telling him it couldn't be done by a blind person. St. Joseph's School for the Blind helped teach him to be self-sufficient, and Lucas, with his motto of "never, never give up," persisted and achieved his dream of becoming a baseball writer. Yankee great Phil Rizzuto became his best friend, and Lucas' columns and stories have appeared in The Jersey Journal and Yankee Magazine, among many others. "Tucci called me last week and told me he's totally committed to making this movie," said Lucas. "Then I was shocked when he then came out and told The Los Angeles Times and other media outlets that he was going to do it." Work on the script for "The Ed Lucas Story" -- the film's tentative title -- began four years ago by the veteran screenwriting team of Lowell Ganz and Babaloo Mendel, whose credits include "A League of Their Own," "Fever Pitch" and "City Slickers." It got sidetracked for several months by a Hollywood writers strike and it wasn't until two years ago that Lucas got his first copy of the script. As per usual in Hollywood circles, the script bounced around for awhile until Tucci received a copy. "He told me that he read it in a half hour and that he fell in love with the story and wanted to play Ed Lucas," said Lucas. The two met in Manhattan in early July. "He just wanted to talk in general to get a feel for me," said Lucas, who added that they had a chance meeting at CitiField later in the summer. "He didn't say at that time he'd do it." Tucci, who's highly in demand, was at the time committed to going to England to complete filming on "Captain America." He currently is on screen in "Easy A" and his new film "Burlesque" is scheduled to open this fall. But when Tucci called last week, he told Lucas that now that he's finished work on those films he's committed to doing "The Ed Lucas Story" and will be shopping around for a studio to produce it. Tucci could not be reached for comment at his Manhattan-based studio, Olive Productions, which he founded with actor Steve Buscemi.